Is it a quick bread? Is it a yeast bread? Is it cornbread? I don’t even know. I just know it seems, to me, a stunning combination of all three. With cheese. What I can say without a doubt is that it is pretty much pure awesome. 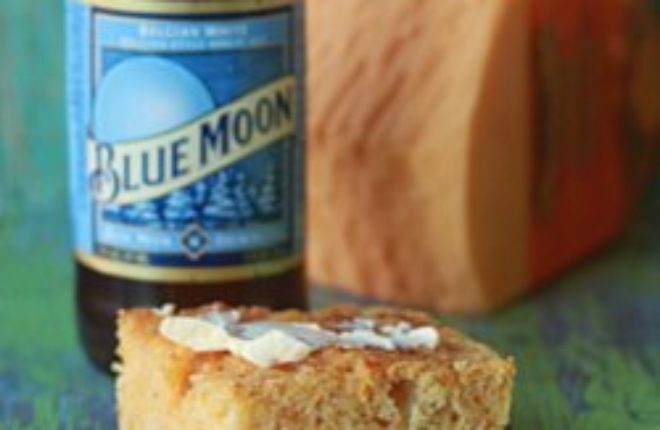 It’s based upon a recent discovery, Sara Moulton’s beer bread. 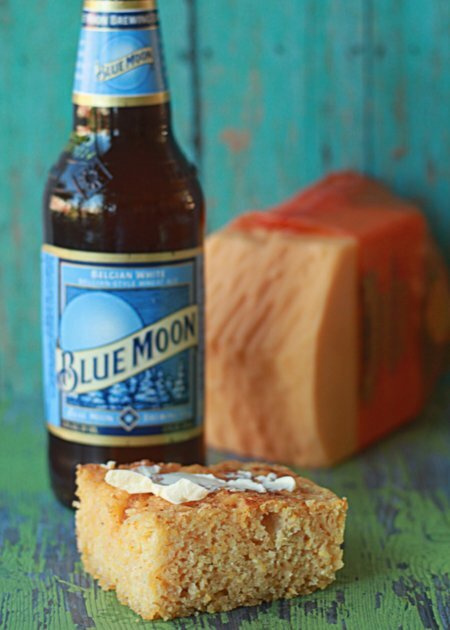 Which really, apparently, is her fan Debbie Bickford’s beer bread. What I say to both of them is this: Thanks, Sara and Debbie, for the recipe, which is really not so much a recipe as a it is a revelation here in our kitchen. It’s so unbelievably easy, for one, that it almost seems like a joke. You might puzzle over the ingredients list – is that really all there is to it? And then there’s the loose, soft batter. You pour it into the pan, shaking your head … is this even going to turn out? What is this? Then it comes out of the oven, looking a little lumpy and a lot ugly, if we’re being honest. But then you notice that it smells divine. And then you lift out a square and, because the recipe doesn’t have quite enough butter (ha), you plop a little more on top. And you taste it. Oh no, my friend. This is no joke. The recipe lends itself to countless possibilities – I can’t wait to try out all the variations I’ve been dreaming up. 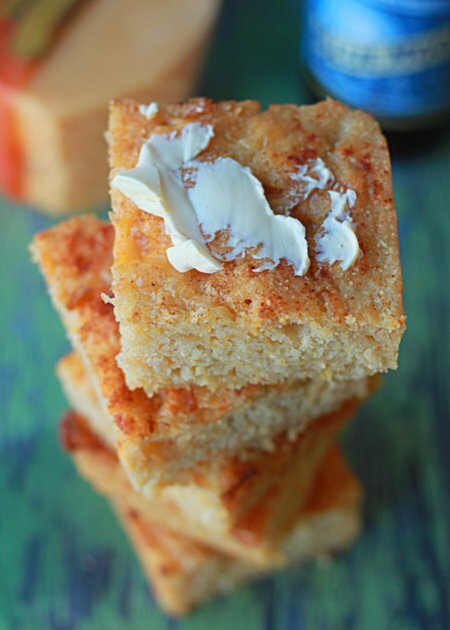 This variation – Cheddar Beer Cornbread – is my favorite so far. 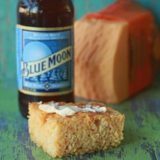 I use a nice Belgian white beer (Blue Moon, one of my faves), then add lots of sharp cheddar cheese and coarse-ground cornmeal. A little dry mustard and smoked paprika accent the flavors of the cheese and the beer. Pure yum, she said, to the chagrin of proper food writers everywhere. Serve this delicious stuff with your favorite fall soup or chili recipe. Make a panini sandwich with it. Cut it into breadstick shapes and place it alongside your spaghetti and meatballs. What can I say? 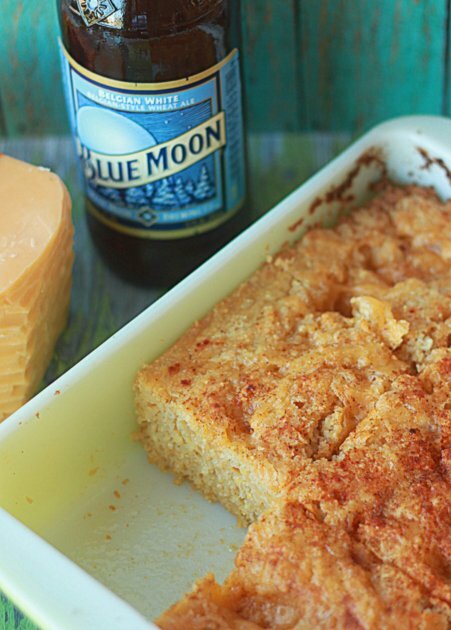 This beer bread is a whole new world. Possibilities abound. Preheat oven to 350 degrees Fahrenheit. Place the stick of butter in an 8-inch by 8-inch baking dish and place it in the preheating oven just until the butter melts. Carefully remove the baking dish from the oven and remove six tablespoons of the melted butter. Set aside. Swirl the pan to distribute the remaining two tablespoons of butter. In a large bowl, whisk together the flour, cornmeal, sugar, baking powder, salt, dry mustard, and smoked paprika. Sprinkle in 1 cup of the cheddar cheese and whisk until blended. Pour the beer over the flour mixture and stir until just blended. The dough will be wet, loose, and sticky. Pour the dough into the buttered 8-inch by 8-inch baking dish and spread evenly. Pour the six tablespoons of melted butter over the top. Bake for about 25 minutes until the middle is set and the top begins to turn golden brown. Oh dear, I forgot that in the directions, didn’t I?! So sorry about that – thank you for asking. You are correct, and I’ve updated the recipe. Your steps 6 and 7 should be reversed. Someone else commented on this already. I was going to make this bread but then I quickly learned just how many ads and breaks are in your preamble to the actual recipe. I then peeped out more of your blog . Ridiculous. I was quickly able to find this same recipe elsewhere. You should really rethink your blogs strategy and/or purpose. Are you a food blogger, a story teller or are you an advertising blog?! I sure can’t tell. I’m sure you’ve noticed that most food blogs have a story prior to the recipe. That’s the format most food bloggers follow and it’s pretty standard fare. If you’d like to read more about that, you can here: https://www.kitchentreaty.com/why-i-dont-just-get-to-the-recipe/. You are also free to use the “skip to recipe” link if you’d like to get right to it. I try hard to achieve a balance between ads and usability. Sometimes I succeed in achieving that balance and sometimes I don’t, but I do try. The fact is that this website is my business, and ads are how I am paid for my time and how I cover my expenses. For instance, hosting alone for this website costs me more than $2,000 per year. So the next time you are bothered by scrolling through preamble and ads, perhaps think about the person behind the blog and the work they have put into the words, photography, recipe, as well as all of the behind-the-scenes expenses they are covering in order to provide you with your free recipe.